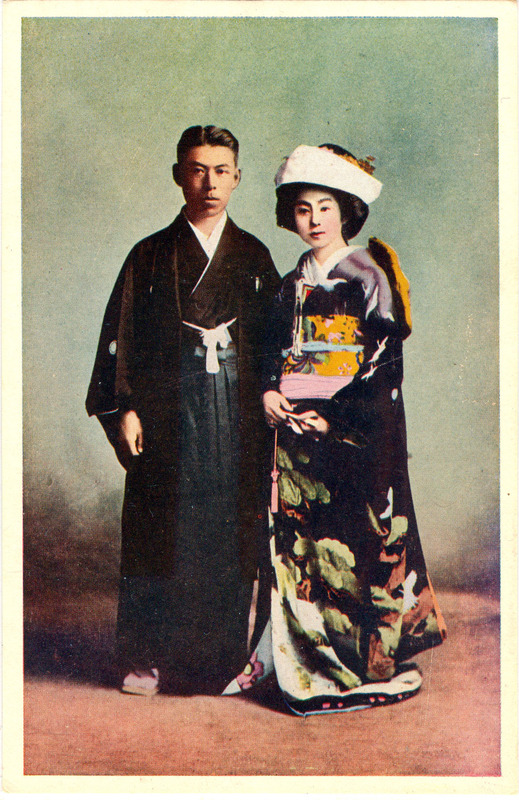 “There still exists [c. 1940] an idea in Japan that marriage is the beginning of love and not the end of it. Although there are some love marriages and of late years these have been increasingly numerous, most marriages are arranged by friends of the families who act as go-betweens of each party after careful inquiries have been made as to the suitability of the proposed match. “… On the wedding day the bride, accompanied by her go-between and his wife, arrives at the bridegroom’s house with a present for the bridegroom. The bride, with her hair dressed in the style of bunkin-takashimada, generally wears three long-sleeved kimono, worn one over the other, the outer being of black crépe-silk with designs of flowers and birds of auspicious significance, and the inner two of pure white silk. “The bride is welcomed and taken to the parlor where the bridegroom is waiting, and there immediately takes place the cremony of san-ran-kudo (‘Three-threes are nine times’), when the bride and bridegroom drink three times out of three different sake cups, by which they pledge their marriage vows.